OCL has carried out a number of individual extensive packages of works at this particular location in recent years. The NDUP (Neasden Depot Upgrade Project) is a five year programme of works to allow complete improvement and regeneration over the whole depot to fully accommodate the new ‘S’ stock trains that are currently in use on parts of the London Underground system. This major project is valued at approximately £50m and involves new maintenance sheds, new lifting equipment, overhaul of a complete signalling system and DC and Power supply circuits. 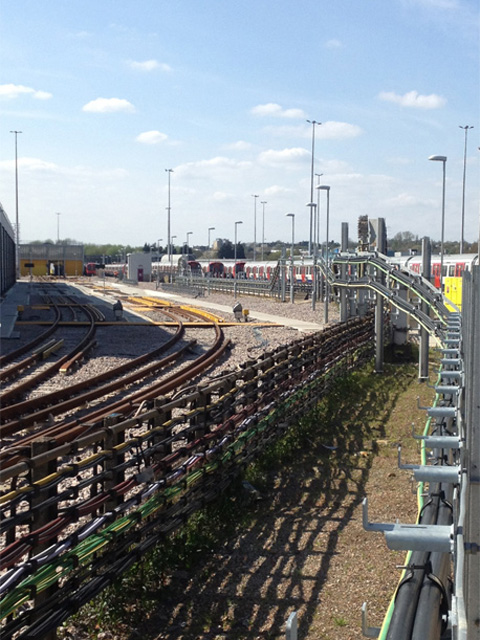 OCL provided, on average, 40 operatives per shift including supervision and management to aid in the installation of complete new cable routes throughout Neasden Depot incorporating all existing main routes and new sub routes. Bespoke CMS work took place on a number of over track crossings including the main depot bridges and the pipe bridge, which OCL was contracted to install a number of SWA and AWA cables across. Again OCL was privileged to be awarded a package of works that included the first ever project installation of GRP TroTrof on any London Underground infrastructure. 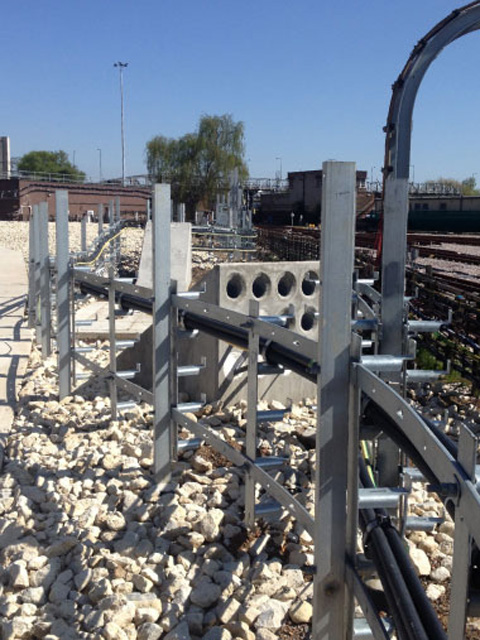 Our specialist troughing gang excelled in quality of install incorporating the complex standards when installing through track beds and adjacent sleepers within a live working depot. All cuts and fabrications were carried out manually on site to suit AOC and gradients within the limited possession times. Delivering this project successfully involved a high level of collaborative working between specialist installation contractor OCL, the principal contractor, the Giffen Group and the NDUP team. This project presented a number of challenges to deliver the installation on time and on budget. Due to the fixed time constraints it was crucial that the upgrade could proceed smoothly without incurring disruption to the operation of the railway network. The installation times were planned around a series of London Underground and Thales possessions at various parts of the depot. All OCL personnel were flexible in their working hours for the duration of this project and they were praised for their ability to plan and provide in ever changing immediate situations. OCL was successful in meeting all programme milestones and completing all elements of work on time and on budget to the Client’s satisfaction. The work carried out at Neasden Depot forms part of the SSL Upgrade Capability Enhancement Programme (CEP) currently being rolled out across the London Underground network. It will lead to improved, more reliable services for London Underground’s customers and a safer working environment for track workers.